The flagship campus of the University of Hawaii System, the University of Hawaii in Manoa has more than 14,000 undergraduates working towards bachelor's degrees in 98 fields of specialization. For the 2014-2015 academic year, freshmen with demonstrable need received an average financial aid package of $13,368 in loans, grants, work-study jobs and scholarships. Total scholarship funding available for UH Manoa students for the same period was $8,516,294. The UH Manoa Chancellor's Scholarship ($10,000 per year) gives a maximum of 80 scholarships annually to outstanding admitted freshmen. The Manoa Merit Scholarship is also for beginning undergraduates and awards a maximum of 100 scholarships annually ($5,000 per year) for academic excellence. College in Hawaii is costly and getting more expensive every year, yet expenditures on need-based aid are eight times lower than the national average. That’s the bad news, but here’s the good news: The state is loaded with scholarship opportunities, so approaching the financial aid process as seriously as you treat college applications can lead to an affordable degree. 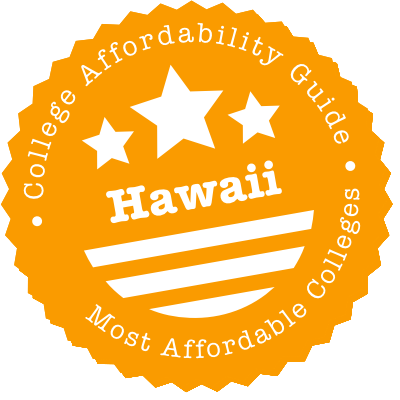 Each of the state’s 10 public community colleges and universities administers its own scholarships and also participates in University of Hawaii systemwide scholarships. The UH system is a government agency, so all state financial aid is distributed through it. If you’re headed to one of the state’s handful of private institutions or want to pad your financial aid package, there are multiple foundations that seek to make college cheap through scholarships, many of them earmarked for Native Hawaiians. We talk about those below and then explain how to lower your cost of living while you study in the most beautiful — and expensive — state in the U.S.
Hawaii college students are able to transfer credits within the University of Hawaii system, which includes community colleges as well as university campuses. Within the University of Hawaii system, core lower-division courses transfer, and associate degrees are guaranteed to transfer as well. All campuses within the University of Hawaii system have a core lower-division course requirement. While the core curriculum may not be the same at all campuses, students who have fulfilled all of the general education requirements will be allowed to transfer credits to another University of Hawaii campus. With this transfer, students will be considered to have met the general education core requirements at the receiving campus. Transferring credits is even easier for Hawaii students who have completed an associate degree. All students who have earned an associate degree at a University of Hawaii community college can transfer to a bachelor’s degree with all lower-division core requirements complete. Students who are interested in earning a bachelor’s degree at the University of Hawaii at Manoa should consider the Ka’ie’ie Program. This program offers dual enrollment and dual admission for students working on their first four-year undergraduate degree. Students begin their studies at Kapiolani Community College and complete their degree at University of Hawaii at Manoa. Students can research courses that fall outside of the lower-division course agreements with the University of Hawaii System Course Transfer Database, as well as University of Hawaii system articulation agreements. The University of Hawaii system is comprised of 10 schools — three four-year universities and seven two-year community colleges. The crown jewel is UH Manoa, located in Honolulu. Unlike most states, which have government higher education offices separate from their public college systems, the University of Hawaii system is a government agency. This means that if you’re headed to a private college, you’re not covered by the state financial aid system. Things get more complicated: The UH Manoa website, of course, features a lot of information specific to that campus, but it also houses some general information about all UH campuses. Therefore, be careful when studying up on financial aid options. Generally, each campus has some iteration of the same financial aid available at any other campus, but that’s not always the case. To cover your bases, as a UH enrollee you should take at least three steps. First, file the UH System Common Scholarship Application by March 1st. Once you click submit, the computer will determine which of the 40+ scholarships you qualify for. Second, check with your financial aid office about its procedures for applying for institution-specific scholarships. Last, go to the University of Hawaii Foundation‘s website. The group’s awards are also reserved for students in the UH system, but they are privately funded. Some overlap with those on the UH System Common Scholarship Application, while others are specific to a particular campus. Both private and public college students are welcome to apply for scholarships outside of the UH system. The Hawaii Community Foundation administers over 200 of them, and you can apply online after setting up a profile. Smaller foundations with their own scholarship programs include the Pauahi Foundation, which prioritizes awards for Native Hawaiians to attend school cheaply anywhere in the U.S., the Outrigger Duke Kahanamoku Foundation, which gives need-based awards to state residents, and the Takitani Foundation, which gives at least $1,000 apiece annually to seniors from almost every state high school. Outside of scholarships, there’s more you can do. The HI529 college savings plan allows you to make college affordable years before you ever get there. My Future Hawaii also takes a big picture approach, giving high school students and adult learners a roadmap for selecting a college, paying for it and graduating with a usable degree. You might also visit Step Up Hawaii, which has some basic tips on where to look for help if you have no idea where to start. Its most useful information is nearly identical to what’s on My Future Hawaii, so use whichever platform you’re most comfortable with. Summary: This need-based grant for Native Hawaiians is administered by the University of Hawaii system. Eligibility: UH students at all campuses — both two-year and four-year — are eligible, provided they are Native Hawaiians. How to Apply: Since it’s need-based, you’ll have to submit the FAFSA. Contact your school’s financial aid office for further instructions. Summary: Students enrolled in a vocational program can get $1,500 from ALU LIKE, a nonprofit serving Native Hawaiians. The award can be renewed for one year. Eligibility: Native Hawaiians who are also state residents are eligible, provided they don’t receive funding from Kamehameha Schools. They must be enrolled half time at an eligible program at an approved school in Hawaii. Nontraditional students take priority. How to Apply: Mail an application to ALU LIKE by August 31st. You’ll need to show proof of admission, verify your Hawaiian ancestry and have your college financial aid information handy. Additional documents may be required. Summary: Kamehameha Schools is a group of K-12 schools with a charitable wing that provides postsecondary scholarships, including this merit award for graduate students. Eligibility: Hawaii residents can apply if they have a 3.0 undergraduate GPA and a baccalaureate (or are in the final year of a bachelor’s program). They must be enrolled full time in a graduate program in the state (public or private), unless they are nontraditional students, who only need to be enrolled half time. How to Apply: Apply online starting in November. Documents to be submitted include a personal statement, letters of recommendation, transcripts and a CV. Summary: Kamehameha Schools also gives a renewable award for up to $8,000 per academic year. The exact amount is based on financial need. Eligibility: Hawaii residents enrolled full time in an undergraduate or graduate program in the state (public or private) are eligible. How to Apply: The application process starts in early October and extends to mid-February. Set up a financial aid profile with the College Board, which costs $25. Kamehameha Schools will then send you login information for its application portal, at which point you’ll need to submit financial documents to the College Board. Summary: There’s a financial incentive for students with Hawaiian ancestry to go into a STEM program at a UH campus. Eligibility: The scholarship committee prefers to give nontraditional students this award, but all Native Hawaiians are encouraged to apply. How to Apply: Use the UH System Common Scholarship Application between December 1st and March 1st. The application includes a personal statement, essays, letters of recommendation and transcripts. Summary: The Office of Hawaiian Affairs wants Native Hawaiians to be able to attend college, and it backs that goal up with scholarship dollars. Eligibility: U.S. residents with Hawaiian ancestry and financial need are eligible. Both graduates and undergraduates are welcome to apply, and the award can be used on the mainland. How to Apply: Use the Hawaii Community Foundation online application, which will submit your name for consideration for this and over 200 other scholarships. Summary: The UH Board of Regents reserves the Presidential Scholarship for 10 juniors transferring into a four-year public university from community college. Scholars don’t have to pay tuition, and they receive $10,000 over two years for educational and travel expenses. Eligibility: Hawaii residents attending a public four-year university in the state are eligible. They must be entering with a college GPA of 3.7. How to Apply: The Presidential Scholarship is an example of a UH system scholarship with varying criteria at each campus. Thus, instead of applying with the Common Application, you’ll have to contact your institution’s admissions office for details. Summary: This scholarship from the UH Board of Regents is worth full tuition and $4,000 for four years. It also comes with a one-time $2,000 travel grant, and goes to just 20 freshmen (16 at UH Manoa, two at UH Hilo and two at UH West Oahu) with exemplary scholastic records. Eligibility: Hawaii residents attending a public four-year university in the state are eligible. During high school, they must have earned a 1380 on the SAT (or 29 on the ACT) and a 3.5 academic GPA. They’ll also be judged on their extracurricular pursuits. How to Apply: Contact your admissions office for details. Summary: Public high school graduates can earn $2,000 a year toward college tuition at a UH school. Eligibility: Applicants must be Hawaii residents who graduated high school after 2005 with a 3.0 GPA. The award is partially based on financial need. How to Apply: You’ll need to submit the FAFSA as early as possible to take advantage of limited funding. Contact your financial aid office for further information. Summary: This endowed scholarship can be applied toward a degree at any of the seven UH community colleges. Eligibility: UHCC students with a disability are eligible. How to Apply: Apply online with the UH System Common Scholarship Application. Summary: Advanced practice registered nurses, physicians and mental health providers can get some of their college loans repaid by agreeing to work at health professional shortage areas in Hawaii. Eligibility: A two-year commitment is required, and applicants have to receive the cooperation of a nonprofit employer, which will be expected to pay matching funds. How to Apply: Apply with the Area Health Education Center (AHEC) at any time. You’ll need to have documentation of your school debt, and there’s a portion that must be filled out by your employer. Summary: Members of the Hawaii National Guard get money toward college due to their ongoing service. Typically, community college attendees can get a full tuition waiver and four-year students pay half. Eligibility: UH enrollees qualify, though military administrators can set further parameters for funding eligibility. How to Apply: Contact the office of the adjutant general for application instructions. Summary: Tens of thousands of service members sent to bases in the Aloha State can pay the same rate for tuition as Hawaii residents. Their children and spouses also get in-state tuition. Eligibility: Undergraduates at UH campuses qualify as long as they are active duty. Veterans can also take advantage of resident tuition if they have remaining GI Bill funds and enroll at UH within three years of their discharge. How to Apply: Submit documentation of your military status along with your application for admission. Summary: Hawaiian residents who want to go into specific healthcare fields often have to look to the mainland for advanced degrees. PSEP allows them to pay reduced tuition when they go. Eligibility: Applicants must be Hawaii residents headed to an approved dentistry, occupational therapy, optometry, physical therapy or veterinary medicine program. How to Apply: Apply for certification as a Hawaii resident by October 15th, then enroll in an eligible program. Summary: Hawaiian residents off to graduate school can pay in-state tuition not just in Hawaii but in 14 other states as well. Eligibility: Students enrolled in several hundred programs are eligible. How to Apply: Apply directly with the graduate school and make it known you’re requesting WRGP funding. Summary: Hawaiian residents who want the low cost of in-state tuition but don’t want to enter the UH system can get a reduced rate at public colleges and universities across the western U.S. Eligibility: Hawaiians enrolled in a member school qualify, although each school has discretion over funding. How to Apply: Apply directly with the college and explain you’re requesting the WUE rate. Living in Hawaii is far from cheap, and some Hawaiians turn to public assistance to make housing, healthcare, child care and groceries affordable. The Hawaii Department of Human Services is the primary starting point for public assistance. It contains the Benefit, Employment & Support Services Division (BESSD), Med-QUEST Division (MQD) and Hawaii Public Housing Authority (HPHA). BESSD distributes SNAP (formerly food stamps), provides subsidies to working/studying parents via the Child Care Program, and runs the Low Income Home Energy Assistance Program (LIHEAP) that makes sure Hawaiians can keep their lights — and air conditioning — on. MQD uses Medicaid programs to cover the costs of healthcare for adults and children with limited financial means. And the HPHA has Section 8 public housing vouchers, which can significantly lower the cost of rental properties for people who otherwise would be crowded out of the market. Applications for these services can be found at the DHS website. Aloha United Way 2-1-1 also has contact information for organizations that help people apply for government benefits. Real estate is at such a premium that most colleges in Hawaii don’t even offer on-campus housing. All of the community colleges are commuter campuses, as is UH West Oahu. When it is available, living on campus is an attractive option for many students. By taking on a roommate and/or sharing a shower, you can spend as little as $3,544 per academic year on accommodation at UH Hilo on the Big Island or $4,585 at UH Manoa on densely populated Oahu. The problem with relying on campus housing at the latter is there are only enough rooms for about 25% of undergraduates. Priority goes to incoming students, so save money by living on campus while you can. If you do have the option, visit the MappingYourFuture.org to see what you’ll save. Although Hawaii is an expensive place to live, rent varies dramatically depending upon the island you live on. Honolulu County residents in Oahu can expect to spend nearly double the average U.S. rate for a studio apartment. Denizens of the Big Island, however, pay a much more reasonable price for the same size place (though utility bills and other costs remain high). Fortunately, several University of Hawaii schools are quite good when it comes to presenting their students with off-campus housing options so they can find the most affordable options. The Off-Campus Housing Referral Program (OCH) maintains online listings for Oahu-based UH students, and you can head to any campus’ website to get specific information about the area, such as this one at Maui College. If you’re located elsewhere or are attending a private school, CampusRent.com also has listings. Meanwhile, the Department of Human Services is there as a last resort. Access its directory of shelters to find a temporary place to stay. Hawaiians have high overall electricity bills due to the state’s reliance on imported oil. The state’s main power provider, Hawaiian Electric, is keenly aware of its dependence on imported oil and offers rewards for reducing energy during peak times. Still a few dollars here and there may not cut it. If that’s the case, BESSD runs the state’s Low Income Home Energy Assistance Program (LIHEAP), which provides one-time payments to financially needy consumers facing a shutoff in the short-term or hardship down the line. The Department of Labor and Industrial Relations, meanwhile, administers the Weatherization Assistance Program, an initiative for similarly low-income residents. By getting a free home assessment along with upgrades to areas that are leaking energy, recipients can save up to $1,000 a year. UH Manoa founded a medical school in 2005, but it has no corresponding medical center, so most students’ first stop for care is the campus health center. If you’re a student at UH Manoa and check your bill, you’ll see a line item entitled student health fee. This enables you to use the University of Health Services and any of its six clinics, which accommodate a general practitioner, nutritionist, dermatologist, psychiatrist, sports medicine doctor and OB/GYN. Keep in mind, you’ll still have to pay to visit the clinics or utilize the laboratory or pharmacy, but the student health fee keeps these costs low. (The clinics are actually open to UH students at all campuses even though they have their own health centers.) If the out-of-pocket expenses are not low enough, community clinics have sliding scales and don’t turn anyone away based on inability to pay. Find a list of them at the Office of Health Care Assurance. While campus counseling is often free, such as at UH Hilo, more extensive treatment may require you to go elsewhere. Network of Care has an online database of mental health clinics and programs, while the State Department of Health maintains its own list of community mental health centers. If your primary concern is that coffee from late-night study sessions is rotting your teeth, UH-Manoa’s School of Nursing & Dental Hygiene has a dental clinic that can save you money on specific procedures, regardless of whether you’re a student there. For more serious work or oral care away from Oahu, consult FreeDentalCare.us or find a list of community dental clinics at the Department of Health. Recognizing the need for nontraditional students to have affordable child care, several colleges in the state have set up on-campus day cares and/or preschools. The University of Hawaii at Manoa is one of them, with its Children’s Center open to full-time students with two- to six-year-olds. Tuition can run up to $3,600 a semester, and since the children’s center was established for enrollees, there are no additional student discounts. Whether you decide to put your kids in the Manoa facility, the school’s child care page is worth reading because it’s packed with resources and recommendations for student-parents across Hawaii. One of its features is a list of child care facilities on other UH campuses, including Alani Children’s Center at Kapiolani Community College. At Kapiolani, the college’s financial aid office can provide additional financial aid just for child care. Yet even with the student-friendly rates, they’re not quite friendly enough, which is why you should look into Hawaii’s two state-sponsored child care subsidy programs — Child Care Connection Hawaii (CCCH) and the Preschool Open Doors (POD) program — if you have a child that’s not yet a teenager. Use PATCH Hawaii (PATCH stands for People Attentive to Children) to find a licensed day care or preschool where you can use that subsidy. There are two reasons to skip getting a car in Hawaii. First, fuel is imported, so Hawaiians pay a premium for gasoline even if they’re just getting regular unleaded. Second, parts of Honolulu are almost as densely populated as New York City, resulting in massive traffic jams in Oahu. Public transportation, then, is a worthy option, especially for UH Manoa and Hawaii Pacific University students, who ride free during the academic year on TheBus. Students at participating schools also qualify for a reduced rate via U-PASS. On the other islands, Kauai Community College students can ride the island’s bus system for free, Maui students can get monthly passes on public transit for $30, and Hawaii County residents in college get half off bus fare on Hele-On, the county’s mass transit service. And don’t forget to capitalize on campus-based systems like UH Manoa’s Rainbow Shuttle, which zips around between classrooms. Grocery bills in Hawaii are exorbitant, running about 50% higher than on the mainland. Students should seriously consider purchasing a meal plan (and are typically required to get one if they’re in a residence hall) to lower costs. While you may start out with the intention of cooking at home every week and avoiding eating out, once school gets in full swing you’ll likely want a quick, convenient meal on campus. Get a discount by purchasing a commuter meal plan through your school, like the one at UH Manoa. And while Hawaii colleges have not joined the national trend of adding food pantries to their campuses, that doesn’t mean there aren’t plenty off campus. You can find them at Aloha United Way 211. FoodPantries.org also maintains a user-compiled list. Pregnant women and new mothers may also qualify for free food staples from the state’s Women, Infants and Children Program. The island of Oahu’s main attraction is known just as much for its dense population as its beaches. In fewer than 70 square miles, the state capital houses around 350,000 residents, plus thousands of tourists that pop in and out for vacations. It also shoehorns in two community colleges, two private universities — Hawaii Pacific University and Chaminade University of Honolulu — and the state’s main public college, University of Hawaii at Manoa. Students at any of those schools can expect their cost of living to be double what is for the average American. Save money on rent by skipping the ocean view and/or living farther away from campus, then buying a discounted bus pass or getting a free one. Whether the apartment is good or bad, the electricity costs are bound to be high, but the college library’s lights are already on and its internet bills are already paid, so study there if you have to. While you’re at it, stick around campus for meals. With groceries in Honolulu costing about 50% more than U.S. averages, a campus meal plan can save you money. ALU LIKE, Inc. runs a variety of programs for Native Hawaiians across the state, including its two-day Money SMARTS course for people wanting to set and meet goals for their personal finances, as well as tutoring and study skills training for low-income youth working toward a postsecondary credential. City and County of Honolulu Department of Community Services oversees the Section 8 Housing Voucher Program, which provides subsidies to low-income families to lower their rent. And its Youth Services Center is aimed at young people interested in pursuing a postsecondary degree even if they struggled in high school. Hale Kipa works with young adults, with an emphasis on homeless youth and former foster children. Its Emergency Shelter Program provides a safe place to go, and the School Success Program gets them ready for the GED so they can go on to higher education. Honolulu Community Action Program facilitates Head Start programs for three- to five-year-olds on Oahu, pairs people with a trained tax volunteers who will help maximize their federal deductions and credits, and administers energy utility assistance through both LIHEAP and WAP. Legal Aid Society of Hawaii is there for those who have financial difficulties and need an advocate who knows the law. For example, it can help people mediate disagreements with landlords over security deposits, navigate public benefit procedures, or avert utility shutoffs. Palama Settlement supports youth from Kalihi and Palama through four annual scholarships, each with its own selection criteria. The application deadline is in mid to late March. YMCA of Honolulu has affordable preschools on its four Oahu locations. As part of its social mission, it also rents out cheap student housing that’s easily accessible to Hawaii Pacific University and UH Manoa. If you’re seeking help in an area not mentioned above, look to Aloha United Way 2-1-1. It’s a comprehensive database of government and nonprofit services. Pearl City is also on the island of Oahu and part of Honolulu County. In fact, it’s just a 30-minute drive up the coast from the city of Honolulu, if you don’t hit traffic. Students at Pearl City’s Leeward Community College shouldn’t expect much difference in the cost of living, but there is some. Whereas Honolulu is a resort haven, Pearl City is perched next to a harbor (Pearl Harbor), so you’re more likely to find big box stores on the water than beaches in this residential area. The problem is it’s difficult to secure accommodation in this suburb. Out of every 1,000 units, fewer than two are available for rent, so you may end up commuting from elsewhere on Oahu. Buy discounted TheBus tickets on U-PASS to save cash. Pearl City Community Association gives out four annual scholarships to graduates of the city’s lone secondary school, Pearl City High School. The website doesn’t feature an application or even much information about how to apply, so interested students should contact the association directly or make an appointment with their high school guidance counselor. Thumb through the Honolulu-based resources above or visit Aloha United Way 2-1-1 to find financial resources related to healthcare, housing, child care and education in the Pearl City vicinity. Hilo, the biggest city on the Big Island, shelters several thousand postsecondary students at UH Hilo and Hawaii Community College. Though Hilo is not as tourist-centric as Honolulu, judging by the cost of living you’d still think you were on a resort. The cost of food, healthcare, utilities and transportation are all well above the national average. However, Hilo residents who are open to renting instead of buying can get a decent deal. Hilo students can further lower costs by getting around town with Hele-On, Hawaii County’s public bus system, which gives them a 50% discount. Bay Clinic is a federally qualified health center, which means anyone who goes there should receive affordable care there whether or not they have insurance and regardless of their ability to pay. The clinic does everything from family planning to cancer screenings to dentistry, with offices spread out over seven locations in the city. The Food Basket is the Main Island’s food bank and delivers to local food pantries. It also signs up eligible participants for SNAP (food stamps); those customers can pay market rate for “Da Box,” a weekly delivery of fresh produce. Hawaii County Economic Opportunity Council is an organization that distributes funds for several social services, including LIHEAP, which provides utility subsidies to residents in danger of having their electricity or gas shut off. HOPE Services Hawaii is a place no one wants to visit, but it’s good to know it’s there. It maintains both emergency and transitional housing in Hilo for people who have nowhere else to go. YWCA of Hawaii Island has a cheap child care facility for two- to five-year-olds and summer care for primary schoolers. Its a great organization, but its funds go to helping area women, not designing websites; give them a call or stop by to get details. Many Oahu-based organizations have offices on the Big Island, so it’s worth looking through the Honolulu services above. You can also visit Aloha United Way 2-1-1 for programs designed to increase access to things such as affordable child care and housing.